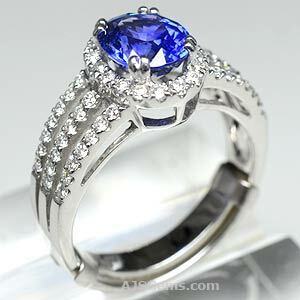 Of all the colored gemstones, corundum -- sapphire and ruby -- is the most popular for special occasion jewelry. When it comes time to select an engagement ring or anniversary gift, sapphire and ruby are perennial favorites due to their vivid color, rarity and excellent hardness. Though diamond is the hardest gemstone, with a rating of 10 on the Mohs hardness scale, sapphire and ruby are the next hardest, with a rating of 9. Corundum is not only very hard, it is extremely durable as well, since it has no cleavage (unlike diamond, which has perfect cleavage). Corundum also presents many color choices. Though ruby is always some shade of red, sapphire is available in a wide range of colors. Blue is the classic sapphire color, with yellow and pink the next most popular hues. Sapphire also occurs in green, orange and white. The rarest sapphire color is a delicate pink-orange known as padparadscha. Sapphire and ruby are faceted or fashioned as cabochons, depending on the quality of the material. Gems that display the star effect are always cut as cabochons. Star sapphires and star rubies are rare and fine specimens are sought after by collectors. Historically, the most famous sources for blue sapphire are Burma, Kashmir and Sri Lanka (known as Ceylon prior to 1972). Of the three, Sri Lanka has been the most prolific producer. Kashmir sapphires are now almost non-existent, since no new material of any significance has been found in the last 100 years. 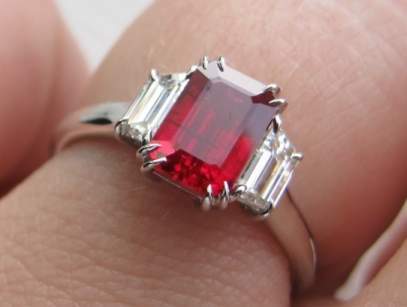 Burma still produces small quantities of fine sapphire, but most mining there is focussed on ruby. More recently, Madagascar has become a significant producer of high quality sapphire, including some fine stones in larger sizes. Burma is the most famous source for ruby, and the Burmese rubies are esteemed for their pure "pigeon's blood" red color. These days very few rubies over 1 carat are being found in Burma, and larger rubies mainly come from Africa, especially Madagascar and Mozambique.